This is an old revision of HomePage made by BrianKoontz on 2011-03-15 01:22:04. [2011-03-11] It's here! Wikka 1.3.1-RC2 is ready for testing. As always, your feedback is appreciated. Anticipated release date for 1.3.1 is 31Mar2011. [2009-09-01] Announcing the release of Wikka 1.2! 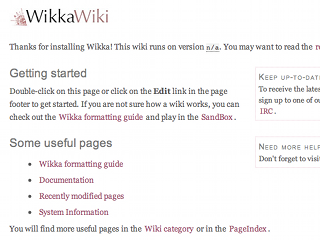 Important: If you are upgrading from a previous version of WikkaWiki, it's imperative that you read the upgrade notes, especially if you have a customized theme for your site.